7 MINUTES NYC EXTRAORDINARY HOME OVERLOOKING HUDSON RIVER 30 DAYS MIN. THIS ONE OF A KIND HOME(4000SF LIVING SPACE)SITS ON THE CLIFFS OF THE PALISADES SURROUNDED BY NATURE ON ONE SIDE WHILE OVERLOOKING THE HUDSON RIVER AND UPPER MANHATTAN FROM THE ROOF TOP DECK.ON THE FRONT SIDE. THE FIRST FLOOR FEATURES A STATE OF THE ART EAT-IN-KITCHEN WITH PROFESSIONAL STAINLESS STEEL APPLIANCES, LEADING OUT TO A SPECTACULAR PATIO CARVED OUT OF THE CLIFF AND PERFECT FOR OUTDOOR ENTERTAINING. ADJOINING THE SUNKEN DINING ROOM IS A SPACIOUS FAMILY ROOM WITH 13 CEILINGS, PANORAMIC WINDOWS, AND A STONE WOOD BURNING FIREPLACE. MAPLE WOOD FLOORING THROUGHOUT THE HOME. THE MASTER BEDROOM INCLUDES A RESORT-LIKE BATHROOM WITH CUSTOM VANITIES, JACUZZI TUB, STALL SHOWER WITH A RAINFALL SHOWER HEAD. PLEASE NOTE THE MINIMUM RENTAL IS FOR 30 DAYS. I personally designed and built this unique home. I put it towards the bottom of the Palisades cliffs with the front of the home overlooking upper Manhattan and the Hudson river. The rear is a 25 foot cliff with lots of beautiful trees and a bird sanctuary. We have lots of deer, groundhogs, all sorts of beautiful birds. I made the whole first floor with extra large floor to ceiling(13' to 15') windows throughout so that you can appreciate the beauty of the natural rock cliff and spectacular trees. 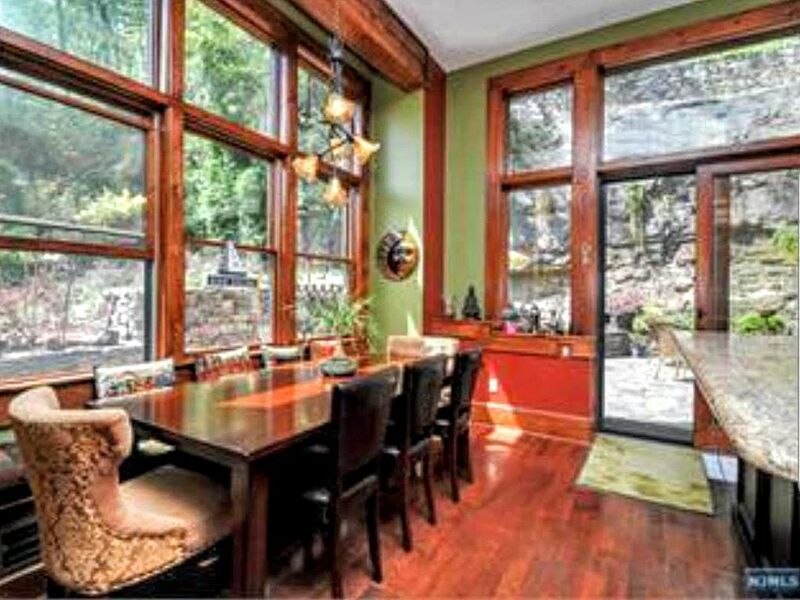 You will feel like you are in the woods, however the front of this home faces the Hudson River with NYC just minutes away. The Sojo Spa (50 million dollar facility) is located one block away. This is one of the largest, newest and most amazing Spa's in the NY metropolitan area. Here is a link below for more information. Sojo Spa one block away. This is a 50 million dollar facility. It has everything you could image a spa would have. the roof top has an infinity pool overlooking NYC. Located next to master bedroom. 2 car parking on drive way. Along the south stone wall on the left side facing the home. set for 8. Please let us know if you need more. One in the master bed room and one in the living room. One located towards the front of the home on the first level when you come in the wroth iron front entrance door. Gas propane grill is provided. Bighmanton Racquet Club located across the street at 737 River Rd, Edgewater NJ Fee for renting a court. Sojo Spa, Infinity pool overlooking NYC. Please note you have to pay $65/day per(current rates) person(16 and over) to enjoy there 50 million dollar facility for the whole day. Massage and food extra. Walk to Trader Joe's, Whole food market, Food Bazaar, Starbucks, Target, TJ max, Marshalls, City Place shopping center with Banana Republic, Anthropoligie, Bareburger, Chipotle, Gap, Guess, Haagen-Dazs, The Original Pancake House, Panera, Pier 1,Victoria Secret and more.